The tower was ahead of a me--a medieval round tower, the sign next to it said, built of gray stone. Coming up the rather rocky path and the higgledy-piggledy headstones ahead of us, the tower was the tallest structure around, the first of these medieval ruins my cousin Liz and I could see. The round tower was built between 900 and 1100, the sign said. 900 to 1100. My country was founded in 1776. We don't have manmade structures from the years 900 to 1100. This tower was older than my country. I reached out a hand to touch the tower's rough stone, placed my palm flat on it. I'm a history nerd and though I didn't know the history of this site we were visiting or of the tower, I knew it was likely to be the oldest thing I'd ever get to touch. "Watch," Liz said. "You touched it. Now it's going to fall down." I side-eyed her. The snark is strong with this cousin. My heroine, Jane, is in London in 1804. She likes to paint and draw, but hasn't done either in the year since her husband died. Also, I need her to re-meet and fall in love with Miles Keegan, in order for this story to have the necessary genre romantic elements. While I was in Ireland, away from my laptop, I brought a notebook with all of my notes for anything related to my fictional Georgian/Regency Keegan universe in it and told myself that I was going to figure out how Jane and Miles run into each other in London and what, exactly, Jane is doing while she's in London besides "figuring out what she wants to do with her life after her year of mourning is up." I had an idea that maybe Jane, unable to resist art, goes to see the latest exhibition at the National Portrait Gallery. 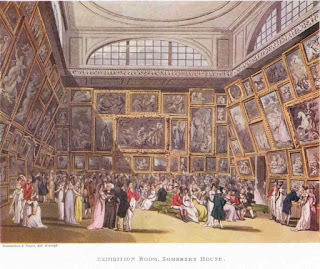 The summer exhibition at the gallery was a staple of the London Season; it was even featured, briefly, in Downton Abbey. In fairness, my cousin Liz and I only went on two alcohol-related tours on this trip to Ireland, so to proclaim one "the best alcohol related tour" isn't quite right. They were both good--if anyone reading this goes to Ireland, Guinness and Jameson are must-gos. The stereotype is that Irish people like to drink, yeah? And they do, for the most part. But that's not the whole story, which is why it grates on my nerves when St. Patrick's Day is used as an excuse to get sloshed. But Ireland is known for several brands of alcohol and they're quite proud of them (and being Irish-American, Liz and I encounter Irish alcohol at home and at family gatherings), so on our first day in Ireland, Liz and I were taken on a tour to the Guinness Storehouse in St. James's Gate, Dublin. 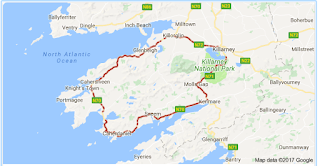 On Wednesday, August 9th, my cousin Liz and I and the rest of the merry band of twenty people who made up our tour group set off from Limerick for County Kerry because we were going to see the Ring of Kerry. The Ring of Kerry is a circular scenic route on the Iveragh peninsula in southwest Ireland. A lot of the roads are quite narrow, which reminded me of visits to Japan as a kid--tour buses do the route in counter-clockwise fashion and cars in clockwise. It keeps buses from bumping into each other and clogging up roads. The Ring of Kerry easily wins best scenery of the trip. I think you'll be able to see why. 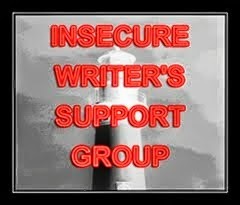 First order of business: I came across a really funny writing-related album on the Facebook: Accurately Titled Novels. 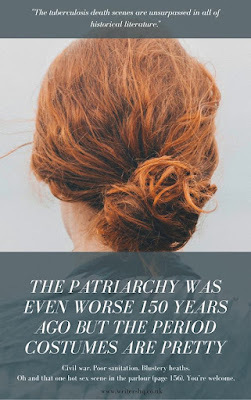 So, I actually wouldn't mind finding this particular stock photo for the draft I'm writing now, since it's a historical mainly focused around a woman who happens to have red hair. Second order of business: I'm going away for a few days with my only girl cousin (Girl trip!). I've no need to be cryptic about this trip, but you know, they say not to post stuff about trips on social media, which seems pretty sound advice to me. We're going to Ireland! We won't be gone very long though, so behave yourselves!